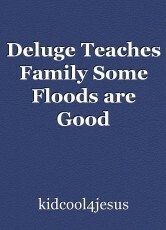 A family discovers that while some floods are bad, others are good. Gabriel, his wife Gabriella, and their daughter, Gloria, lived in an area where damaging floods were prevalent. About a year ago, a flood had totally destroyed the family’s home, and they built a new house from some of their savings. The current year’s flood season was at its peak, and weather forecasters were predicting still another record-setting catastrophe. The predicted heavy rains were, indeed, followed by massive flooding. Having learned a lesson from the previous year’s deluge, Gabriel, Gabriella and Gloria heeded the warnings and headed for higher ground. After the flood waters eventually receded, the family headed back to their house. The damage almost equaled that of the previous year’s flood. The basement had been turned into a gigantic swimming pool, and the water had risen about halfway up the walls of all the house’s rooms. Damaged appliances, destroyed food items, and fish swimming through the inside-the-house lake, all greeted the trio as they entered the front door. Room by room, the trio examined all the home’s contents. Almost everything was ruined. © Copyright 2019 kidcool4jesus. All rights reserved.